November 17, 1978 -- The world was certainly a different place when Bert Knapp began as a news broadcaster at WMCA radio thirty years ago, in the late 1940s: Television was in its infancy, with regular network TV newscasts still many years away. Newspapers predominated as the heralds of news and truth. Walter Winchell, dispensing neither, was king gossip columnist for newspapers and radio alike. And news organizations from both radio and newspapers were locked in fierce competition. According to Knapp, now the News Supervisor at WMCA, that competitiveness between radio news departments has dissipated in the last few years. "We each try to do as good a newscast as we possibly can," says Knapp of the competing New York stations, "but the days of the 'scoop' really are over. To have it first doesn't mean a darn thing, because first of all you only have it first to the audience who has it first at that particular moment, and it doesn't mean a darn thing to anybody else... and if you have a story that breaks and you get it 10 seconds or even... twenty minutes before another station, what does that mean to the other listeners who are listening someplace else?" "I find that most of the local reporters almost work together as a team: They exchange their notes and they exchange their facts, and we all get it on at approximately the same time. The day of the fedora with the press card sticking out of the hat has long gone." 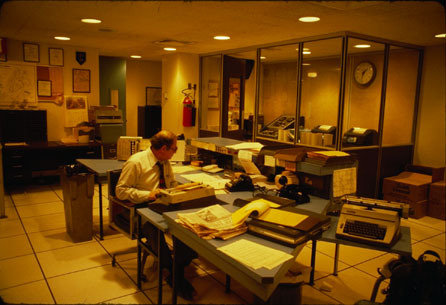 Hear how WMCA newscasts sound in 1978, plus an interview with WMCA News Director Bert Knapp. WMCA itself has undergone many changes since its early days, with station formats varying from popular standards to Top40. The format of WMCA now is primarily telephone talk, with a heavy emphasis on sports. Today, in the Fall of 1978, WMCA has a small department, and relies heavily on wire copy. "[The format is] very informal and very breezy," explains Knapp. "Because it is all telephone talk, and there is no music at all played on WMCA, 24 hours a day, we're talking." All WMCA newscasts are five minutes long, and run on the hour and on the half hour -- with the exception of the six o'clock news where the station runs a ten minute newscast. On the half-hour, the station runs four minutes of Mutual [network news] with one minute of WMCA local news. On the hour, the station runs four minutes of its local news and one minute of the network. As an all-talk station, WMCA has the luxury of being able insert short news items just about anywhere in its programming. Knapp says that means that important stories can get on the air as soon as they move on the wire: "We run our news 24 hours a day, national and international. And if there's a local story of course, because of the type of programming we have -- telephone talk -- it gets on immediately. But there isn't a formal newscast other than morning and afternoon drive locally. Now, late at night of course, you have to realize that television takes over from the news, and we don't try to compete with television." The station uses actualities [sound bites] in a newscast when they'll add color, says Knapp. "We use as much actuality as we can, but we don't use it 'just to use it.' But we use actuality when it is germane to a story. To have sound when it means something -- [that's] very important." But, rather than just running sound for its own sake, WMCA prefers to use precious news time instead to tell another story, or expound on a story that's already in the newscast. "Never use sound just to fill up time," admonishes Knapp. "To have sound just to have sound I think is ridiculous. " With so much talk, how does WMCA set priorities on stories? Knapp says leads are often determined by timeliness. "Today it happens that Sparky Lyle, who is leaving the Yankees and going to Texas, held a news conference regarding a new book that he wrote called The Bronx Zoo about the trials and tribulations of the Yankees. Now that story is a good lead story, unless we have something that is earth shattering. And I think that would take precedence in the early part of the day against the story of the Mid-East situation as it stands now. However, if we had an announcement that there was going to be an agreement [as a result of President Jimmy Carter's orchestrated talks on the Middle East], of course that would take precedence. It's according to what's hot at the moment. Radio is an immediate type of communication, and that's the way we handle our newscasts as well." The information mix can also be determined by time of day: "In the morning, I think you have people who are listening not only for the news, but for the weather, and time checks, and whatever," explains Knapp. "In the afternoon when people are starting to come home, they want to know what happened during the day if they did not have access to a radio." WMCA targets a general audience with an age range of 25 to 49, but also claims an audience that extends to listeners who are in their fifties and sixties. "Our type of programming is telephone talk and interviews, and it spans everything from the conservative to the liberal to sports to nutrition shows, and therefore throughout the day we get practically everybody," says Knapp. "Carrying play-by-play of the Islanders hockey games we do get a larger audience at night in sports than most of the other stations will get because of that," says Knapp. "It's a general cross-section of the populace." 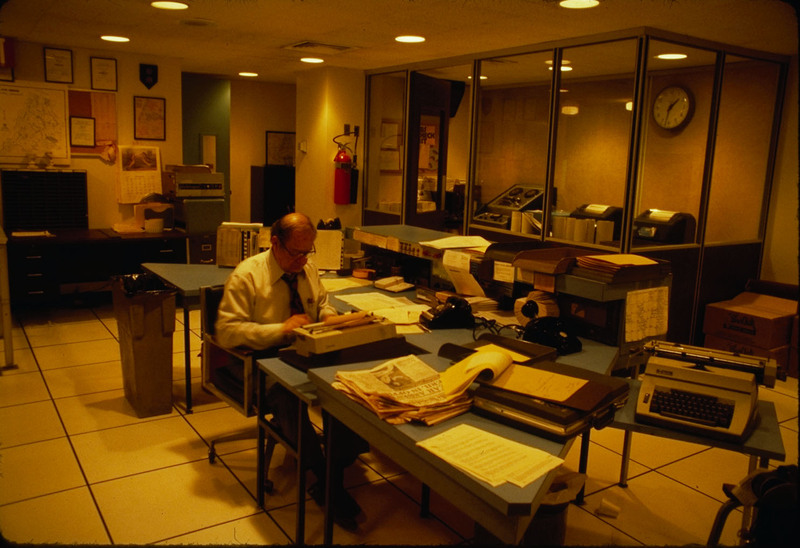 News Supervisor Bert Knapp hammers out an afternoon newscast from the WMCA news room. "We've had an internship program at WMCA for the past several years on and off. But, we find we are not getting the cooperation from the colleges and this is something that really surprises me... Most journalism schools throughout the country, although good -- and they are teaching the basics -- are still not up on exactly what it is all about in the industry. I found some schools are actually teaching 1936 radio." "I think if the colleges would cooperate with the various radio stations -- and I know many of them are interested in intern programs -- it would be beneficial to the college, to the student, and of course to the radio station as well. But for some reason, there's a lack of cooperation and I, for one, just can't understand it," says Knapp. "And [from] a station like this, I know it's a tremendous help to the few young men that we have had working here. Some of them have gone out into the professional world after graduation and it has helped them immeasurably, because we're teachers as well as the professors. Maybe they feel like we're competing with them, because we're teaching as well. They shouldn't think that way at all. We're not interested in their jobs... they may be interested in ours, I don't know [chuckles]. We're interested in helping. And anytime we can help, we're willing to." Finally, Knapp has a few words for broadcast and journalism students just starting out. "First of all, I would say heavy on your liberal arts courses," advises Knapp. "Your social sciences, your humanities, English... background is more important that the technicalities that you learn. Fine if you go to journalism school, but heavy as you possibly can on background." "And another bit of advice: Don't try the five or six top major markets when you come out of school, for one good reason: Make your mistakes out of town where they don't hurt you. If you make a mistake in a smaller station, and you get fired, so what? You go out and you get another job at another one. But if you hit the major markets, where do you go if you don't make it?" WMCA Datasheet - Station stats on staffing, wires, cart machines, and much more! WMCA Anchor History - A partial chronology of anchors and personnel at WABC, from Bill Dulmage's site. WMCA Today - WMCA adopted a "Christian Talk" format in 1989. A WMCA Tribute Page - Allan Sniffen's tribute to the past glory of 57 WMCA and the "Good Guys" days. Another WMCA Tribute Page - Another nice tribute page.